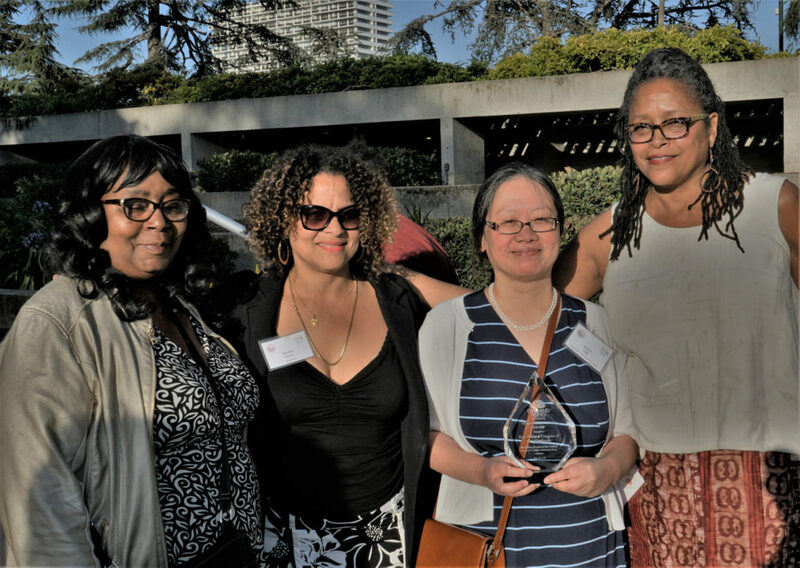 Left to right: Huba Sherry, the Congress of Neighborhoods, Sandra Davis, award presenter, Angie Tam of the Congress, and Nehanda Imara, East Oakland Building Healthy Communities at the 2018 Townie Awards. 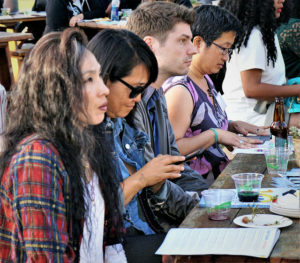 Social Justice activists partied down on?June 28?at the Oakland Progressives Party + Townie Awards? at the Oakland Museum. 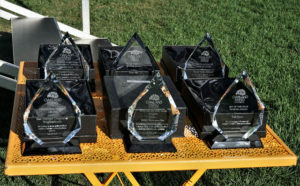 The combined party, fundraiser, and awards ceremony, occurred in the museum’s sculpture garden. It was also a 10th anniversary celebration for Oakland Rising. 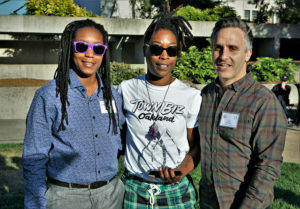 The awards celebrate the work of Oakland’s social justice warriors –?the activists, organizations, and other leaders who advance?community-led solutions supporting the interests?of working-class and immigrant communities of color. 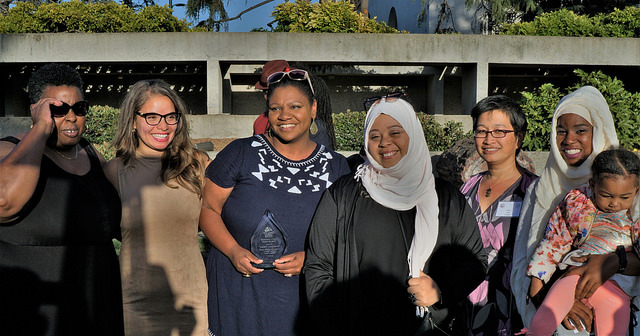 Award recipients include a woman who’s bringing a racial justice lens to transportation governance on the BART board, current and former leaders of? organizations who are now stepping up to run for office, a neighborhood-based coalition that is taking power into its own hands in the wake of neglect by its city council members and? local businesses that truly value community. 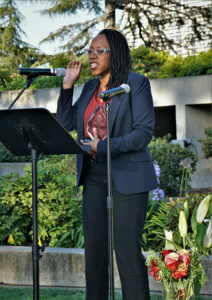 In her opening remarks for the awards, Jessamyn?Sabbag, Executive Director of Oakland Rising, ?encouraged the crowd to prepare for the upcoming and future elections by growing a reliable base of progressive voters. “We have to learn how to stand for our values in face of transactional and short term thinking, ” she said. 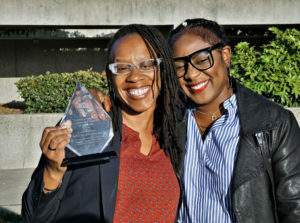 That message was re-emphasized by?Lateefah Simon, winner of the Government Official Townie, who was elected to the BART Board of Directors running on a platform of equity, dignity and justice. 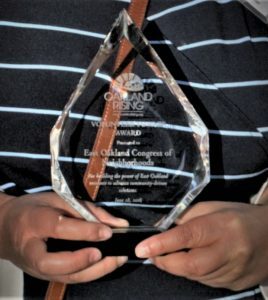 ?The new multi-organization and multi-area Congress of Neighborhoods ?won the Townie Volunteer award since it is basically a volunteer organization with staff support from organizations that partner with Oakland Rising. 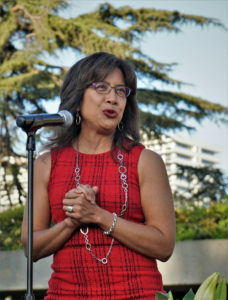 Regarding Oakland’ Rising’s 10th anniversary, Sabbag told the audience she was proud of the work the organization has done over the past decade. Oakland Rising has?worked on Costa-Hawkins rent control limitations and also on Oakland’s Tenant Protection Act which outlaws landlord harassment and neglect as methods of evicting tenants.? In 2014 it worked to pass Measure FF by 82 percent, increasing Oakland’s minimum wage and providing workers with paid sick days. “Oakland Rising tries to bring economic and racial justice ?to the neighborhoods of Oakland,” Rev. Damita Davis-Howard, Oakland Rising’s political director, told Oakland Voices. She said the organization partners with nine groups throughout the city including Causa Justa, EBASE, the St. Mary Center, and the Ella Baker Center. “I loved the diversity of crowd (at the Townie Awards) and I’m proud that people in this city recognize the efforts to preserve that diversity and culture of caring for each other and honors the people and organizations that do this on a day-to-day basis,” Davis-Howard said. 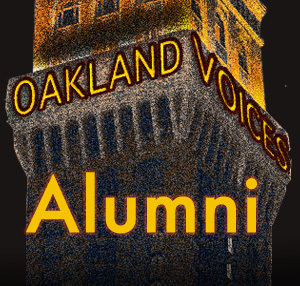 Parent Voices Oakland – Youth Advocate Townie? Lateefah Simon, BART Board of Directors – Government Official Townie? the crowd at the Progressive Party.